The Fellowship was fortunate enough to obtain a copy of MIAMI VICE REMIX #1 from IDW Publishing and Lion Forge Comics. The story is written by Joe Casey, with art and letters by Jim Mahfood, and colors by Justin Stewart. Crockett and Tubbs are taking some extreme measures to maintain cement their pusher image amongst the criminal element…and it works. However, there is a new drug in town called Miami Bath Salt, and it leads to some unusual side effects. Could it have something to do with the Calderones and the drive by that almost took out our heroes? Plus, Lieutenant Castillo’s daughter is missing and he is at his wit’s end. Is all of this tied in together somehow? Crockett and Tubbs - the original buddy cops are back! Jim Mahfood and Justin Stewart create a unique and striking visual. It’s very reminiscent of the TV show, different from any other book out on the stands, and just plain cool to look at. While Joe Casey’s story is good, but it’s not great. It doesn’t read like a first issue, which can be a bad thing if you’re not familiar with the characters or the show. 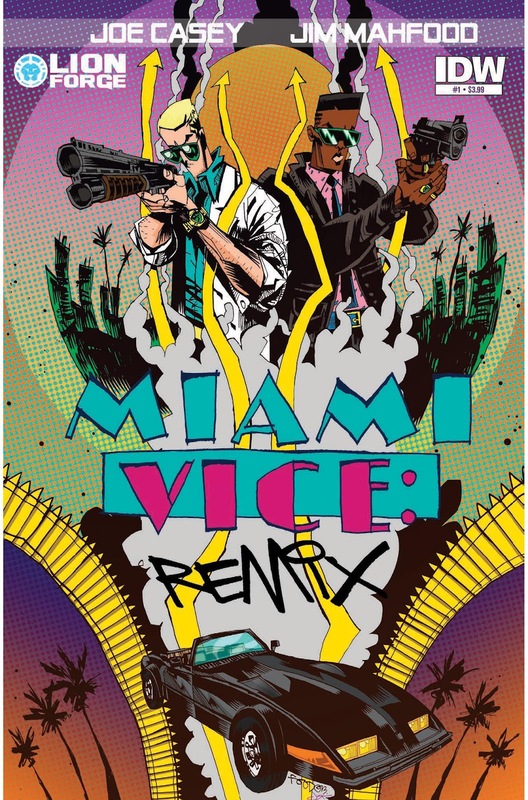 MIAMI VICE REMIX #1 is in stores now, or available for ordering at www.idwpublishing.com.